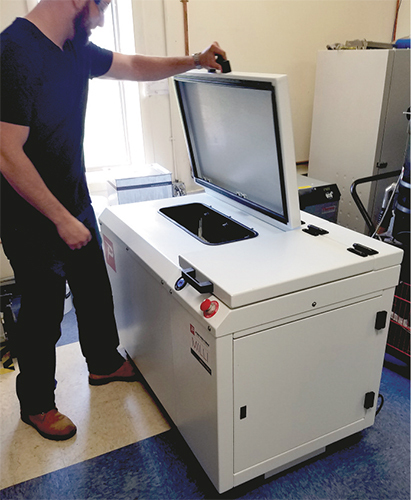 New finishing technology enables Harbec, Ontario, NY, to dramatically reduce post-processing time and costs for 3D-printed parts. Manufacturers, just like people, have unique outlooks and personalities. Though all are in business to be successful and profitable, the path traveled varies greatly. Suffice to say that Harbec, an Ontario, NY, maker of prototypes, tooling, machined components and injection-molded parts, not only followed a less-traveled path, it swung the scythe and carved the path itself. And, just as the personalities of manufacturers often take on the personalities of their owners, there’s no doubt that Harbec has done that, too. Bob Bechtold, Harbec’s founder, has had a unique outlook on life and work from his early years. As detailed by FuzeHub, the Manufacturing Extension Partnership Program Center for New York State, Bechtold as a child was fascinated by “the magic of energy,” as he put it, and tinkered with kites, airplane models and magnifying glasses to capture the sun’s rays. After high school, he became just as interested in toolmaking, taking on an apprenticeship and growing his toolmaking skills through a three-year U.S. Army hitch followed by work as a journeyman toolmaker. He then used his knowledge and experience to teach college and trade-school courses in machining and precision measurement. Witnessing firsthand the growing influence of NC and then CNC machining, he reasoned that the toolmaker of the future not only would need a toolbox, but a computer as well. His vision of a smart, tech-savvy future led him to launch Harbec in 1977. He would operate a traditional business in a decidedly untraditional way. From its markets to its products to even its energy-conservation and sustainability efforts, Harbec continues, successfully, to carve a unique path. In 50,000 sq. ft. of manufacturing space, the company’s 135 employees work across three shifts in a unique setting that includes leading-edge air/energy-reclamation systems and electricity-producing windmills. Now in its 41st year, Harbec performs primarily injection molding, CNC machining, mold building and 3D printing of metal and nonmetal parts. Adding to its forward thinking, the company has adopted a new automated part-finishing concept, which promises quicker and higher-quality post-processing of 3D-printed metal parts. 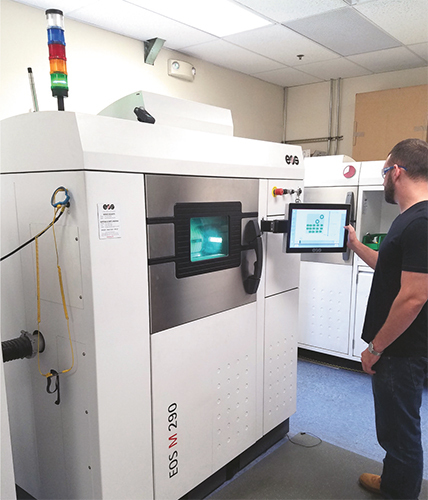 Harbec entered the additive-manufacturing (AM) arena about 25 years ago, according to Keith Schneider, its general manager, bringing in a machine for prototyping to supports its plastics division. Today, Harbec 3D prints a variety of material, using two EOS machines for metal alloys, and Stratasys and 3D Systems units for plastics, along with some smaller desktop printers. Delivered to Harbec in 2005, a metal-part-producing EOS M 270, recalls Schneider, was one of the first such machines installed in the United States. On the metal-AM side, Harbec produces tooling inserts to support its injection-molding operations, as well as parts for outside customers across a number of markets. This direct-metal-laser-sintering machine builds parts that route to an adjacent surface-finishing machine at Harbec. Simple installation and quiet operation make the finishing-machine’s location ideal, according to Harbec officials. 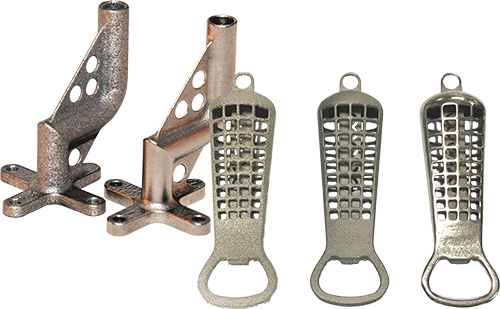 Finishing operations can represent a huge bottleneck in the 3D-printing process when creating parts, especially metal parts. Unfortunately, the term 3D printing has fostered the idea that the process is as easy as using an ink printer: Simply “print” a part and off you go. As we have come to know, there’s so much more to producing parts via AM, and much of that involves the meticulous finishing process. Adopting the latest finishing technology is a no-brainer for Harbec, which also rides the leading edge on so many other processes and technologies. Schneider sees a part as halfway done after printing. “We CNC-machine 85 percent of the parts that come off of our machines, just for accuracy,” he says. “Tolerances may be ±0.005 in. coming out of the machine, and our aerospace customers, for example, want less than ±0.001 in. So initially we look at the geometry and figure out exactly what areas must be machined to tight tolerances. We add additional stock to those areas. And, if we have surface-finish requirements, then we plan on tumbling the parts to meet those requirements. In tune with the importance of rapid, accurate finishing, in 2015 Harbec brought in a prototype finishing (tumbling) machine from PostProcess Technologies (www.postprocess.com), after meeting the company’s founder, Daniel Hutchinson, at an AMUG conference. Edge rounding was Harbec’s biggest concern with tumble finishing. With what can be best described as smart technology, PostProcess’ machines employ algorithms that control energy distribution. The algorithms work in combination with the chemistry of cleaning agents, the material properties of the cleaning media, and hardware that enables the entire system to function efficiently and quietly. In 2017, Harbec brought in a new PostProcess Milli machine, incorporating newer technology and designed to practically eliminate noise. Harbec stations the machines directly next to its metal printers. During 3D Metal Printing’s visit, we saw it positioned adjacent to an EOS M 290 direct-metal laser-sintering system. Only a 120-V electrical hookup is required to power the Milli, and like all of PostProcess’ finishing equipment, the machine at Harbec rests on coasters for simple movement to wherever needed. The finishing machine’s proprietary AutoMat3D software computes cycle times with detergent dosing based on the software’s preprogrammed recipes, built from hundreds of benchmarked parts of almost every 3D-print material on the market. The Milli features a noise-suppression enclosure and single-button operation. It is self-contained, with premixed chemicals poured in, parts added, and the machine set to its programmed cleaning regimen with chemicals dispensed into the cleaning media automatically. Then, finishing can be forgotten as operators return to printing or other duties. In operation, the machine combines vertical motion with PostProcess’ reportedly environmentally friendly consumables to achieve the required surface finish. The Milli, ideal for larger parts with its 28 by 10 by 12-in. work envelope, can employ a divider to run two smaller-envelope sizes with different abrasive media. PostProcess, claiming to be the first and only provider of automated and intelligent post-processing for 3D-printed parts (see Smart Finishing Takes Shape subhead), estimates that using its technology can provide cost savings of 90 percent as compared to full-manual-labor finishing, with an average ROI of 17 weeks. Employing the automated surface-finish technology required only a short learning curve, according to Schneider. Located adjacent to a metal-AM machine, this surface-finishing unit smartly and quietly does its job. Now, while cycle times for finishing vary based on part geometry and materials used, the process does not hold up Harbec’s manufacturing processes in any way, reports Schneider. Before obtaining the new post-processing technology, Harbec performed “a lot of hand finishing, and everyone hated it,” says Schneider, with a chuckle. “Or, we would intend to machine-finish the entire part and just print near-net on 100 percent of the dimensions, followed by CNC machining. That’s still an option, but placing parts in the surface finisher and walking away is a much-less-expensive option. Analyzing various methods for producing a part, stresses Schneider, is one area that sets Harbec apart. Paralleling its flexible approach to customer needs, Harbec cross-trains its employees and can shift resources between processes as required. It’s clear that Harbec readily welcomes technologies and processes that can deliver better options for its customers. As hinted at earlier, this approach is part and parcel of the company’s culture—unique among traditional manufacturers and fostered by Bechtold’s long-time embrace of innovation. This includes environmental awareness, which began for him when he installed a windmill at home in 1980. Today, two onsite windmills provide for 60 percent of the facility’s energy needs, according to Schneider. And, the company reportedly was one of the first in the world to install a combination heat/power plant powered by microturbines. Here, as explained in a Rochester City Newspaper article, generators burn natural gas to create electricity, with steam produced during the process used for plant-wide heating and air conditioning. This provides another 20 percent of the company’s required energy. The remaining 20 percent—only via carbon-free sources—is purchased from the grid. To offset Harbec’s carbon emissions and those of company vehicles, the company purchases carbon offsets. Conservation does not end there, however, as Harbec, through water recycling and rainwater retention, relies on municipally supplied water only for handwashing and drinking. For his part, Bechtold, who once sought funding and acceptance of environmentally friendly initiatives based on a green philosophy, found much greater success pitching its real economic benefits. Following years of interrogating radar systems for the U.S. Navy in addition to a background in engineering and additive manufacturing, Hutchinson, PostProcess Technologies’ founder, president and chief technology officer, had an idea. Why not interrogate 3D-printed parts to better perform critical yet often overlooked post-processing? While design and build have garnered considerable attention during the ascension of AM, post-processing mostly was stuck in the past, with manual finishing—a 150-yr.-old task—the most common route for newly printed parts. According to the company’s own research, in more than 95 percent of cases, printed parts have supports to be removed, and more than 60 percent require surface and/or other finishing. Seeing that labor-intensive manual finishing could be transformed via technology and automation, he got to work and in 2015 PostProcess was born. Traditional finishing operations may house labs of employees, all with different skill levels, performing the somewhat mundane job of hand sanding. Companies may spend much time and money to recruit, train and retain these employees, and still, from part to part and batch to batch, finishing results will vary. In developing the company, Hutchinson saw the need to educate the 3D-printing community on his belief that AM is an integrated process with design, build and post-print intertwined. By taking into account each of these three facets along with the others, a better total project outcome may be possible. Focusing strictly on AM parts and envisioning an integrated process, Hutchinson identified a culture that would drive machine development. “Culture, machines, software, consumables—these four set us apart,” he says. Last September, PostProcess Technologies moved into its new Buffalo headquarters, which includes expanded space for the company’s Finish3D lab. The lab houses R&D, customer-benchmarking and training activities, and offers product demonstrations. In its facility, the company develops, refines and sells a suite of products, including support-removal, surface-finish and hybrid machines in various sizes, as well as wastewater-treatment technology. Key to machine performance is development of proprietary software that takes into account material properties, part geometries and finishing requirements to optimize agitation intensity and direction as well as the introduction of detergent. Cleaning solutions and abrasive media can be selected to match the given materials and requirements. Together, these developments represent a first in finishing technology for 3D-printed parts, according to company officials. Given its integrated-process culture, PostProcess often advises manufacturers on design and build issues that can affect post-processing, according to CEO Jeff Mize. The company’s equipment for removing the supports uses proprietary technology to check material density—in many cases, material density differs across supports and across parts—and remove supports while leaving the part intact.